Butter milk softens, brightens and exfoliates the skin to give it a youthful glow. A mild bathing bar with the goodness of butter milk and high content of olive oil, creates a rich creamy lather to soothe skin conditions. It is suitable for all skin types. Saponified canola oil, palm oil, coconut oil, castor oil, buttermilk, water, red clay, almond powder, kaolin clay, sandalwood powder, Vinegar. Packaging :ButterMilk soap comes wrapped in a transparent sheet. 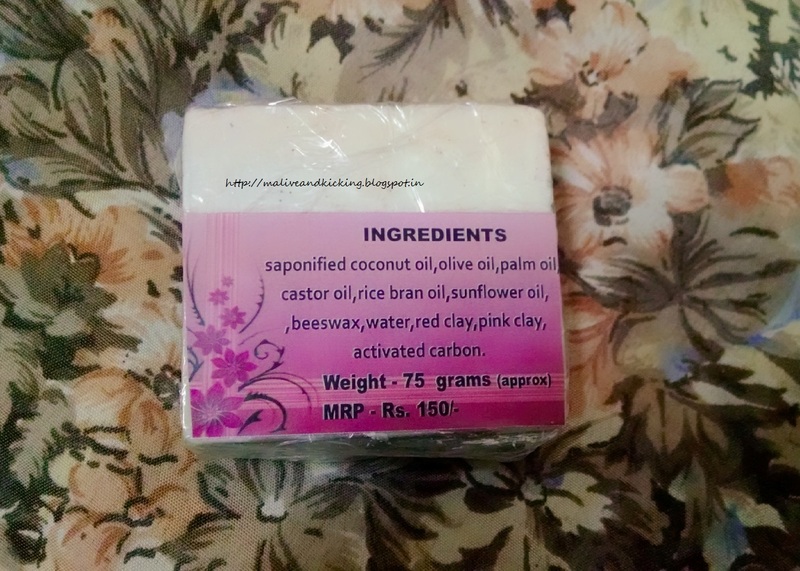 There are labels on either sides of packaging stating the soap name and its detailed ingredients with price etc. 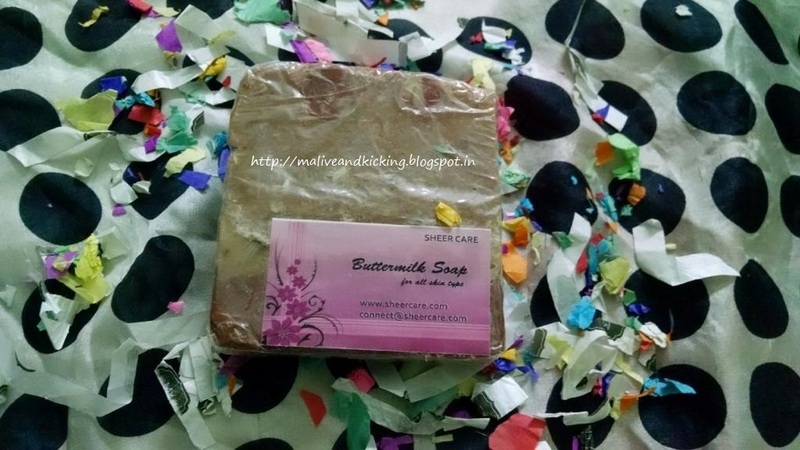 The Buttermilk soap is prominently a brown color soap bar. 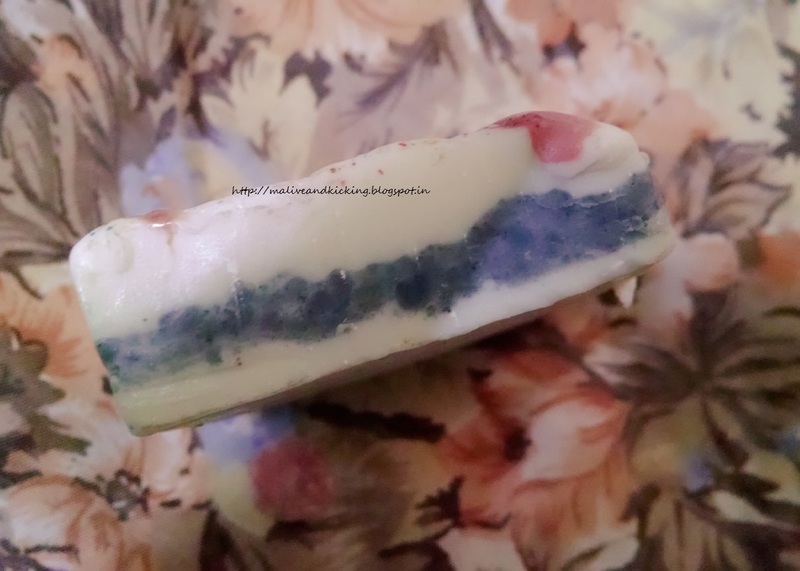 The soap has multicolored stcks on it due to colors that its major ingredient have rendered it. You may clearly make out the presence constituents like kaolin clay, red clay etc. unlike most commercially available soaps; so I am completely trusting what all has gone into the making of the soap. 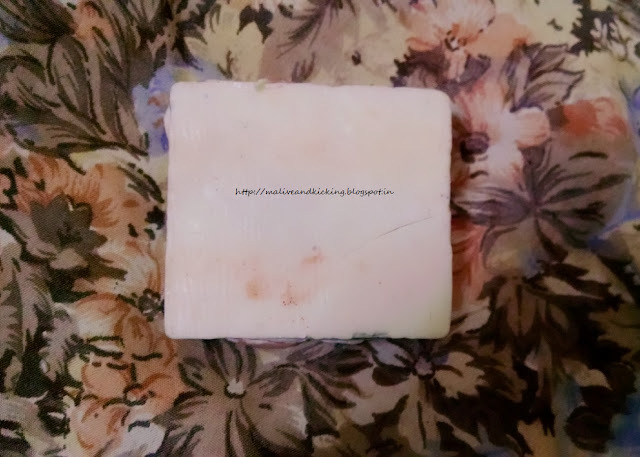 The soap looks jumbo size when you hold it in your hand so I didn't mind cutting it into two halves and saving one of the piece for later usage. The soap is quite soft in texture as well as gentle on skin. I can't stop admiring the inclusion of so many base oils in the recipe that make the soap so rich to make skin feel super moisturized. The soap feels so mild on skin that I may recommend it to those with sensitive skin too. 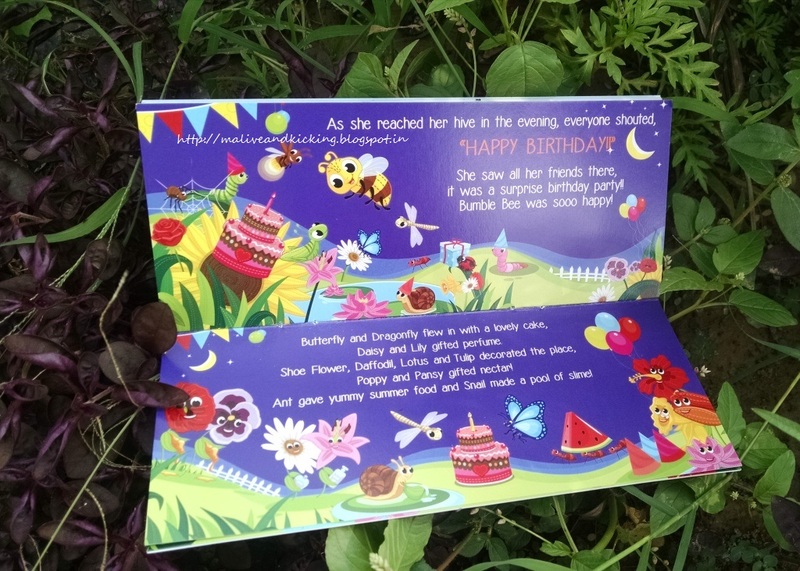 Now talking about its fragrance, the soap has very faint scent which you cannot smell without a close sniff. I wish it were a bit stronger for making the shower more refreshing. This completely natural soap manages to provide soft lather that cleanses the skin really well. 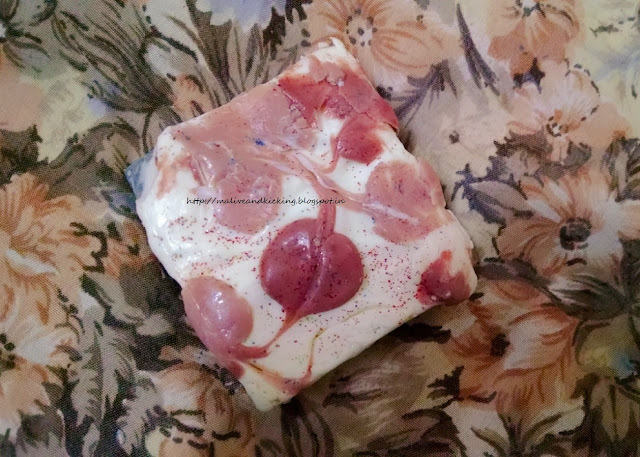 An interesting incident happened when my son was bathing with this soap for the first time as he always insists to be the first user of any soap before I use them for reviews ;) The soap gives lather of somewhat dark red color (probably due to red clay) on rubbing on skin. So the brat played the prank with me shouting from inside the bathroom "mumma, my hand is bleeding." And as I rushed in, he grinned n said "this soap foams in red color" that eventually turn into usual white..
Then, on my own usage, I loved its velvety feel on my skin which didn't exaggerated the dryness on my skin. The soap is so easy to rinse as well. After a regular use of few days, the soap softens the rough spots on skin n you would see quite a glow in skin. 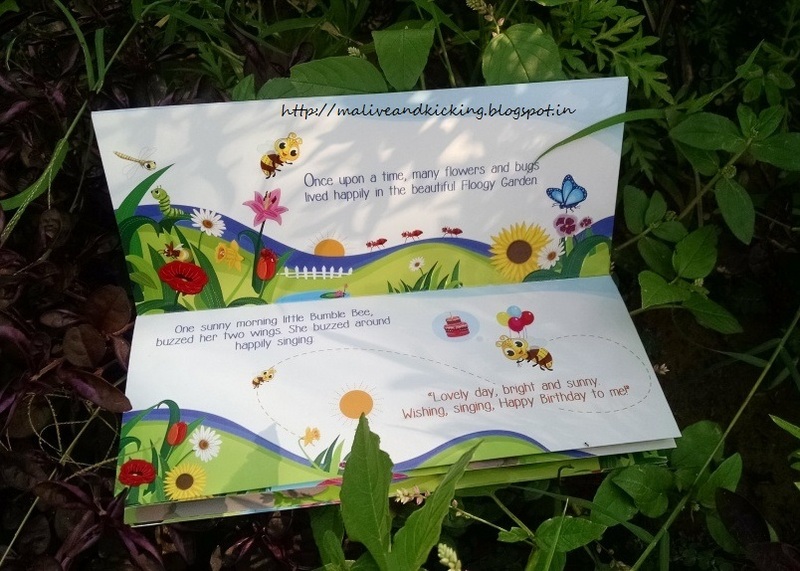 The buttermilk also treats age spots, soothes damaged skin and sloughs away dead cells. 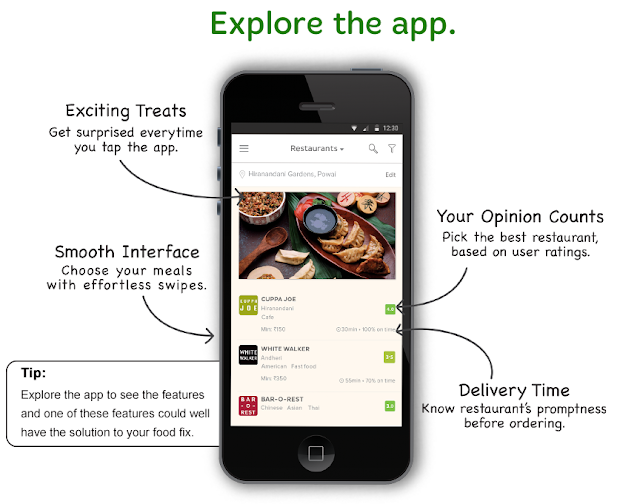 Loaded with many nourishing oils. No artificial perfumes or colorants. Reasonable priced for its ingredients. 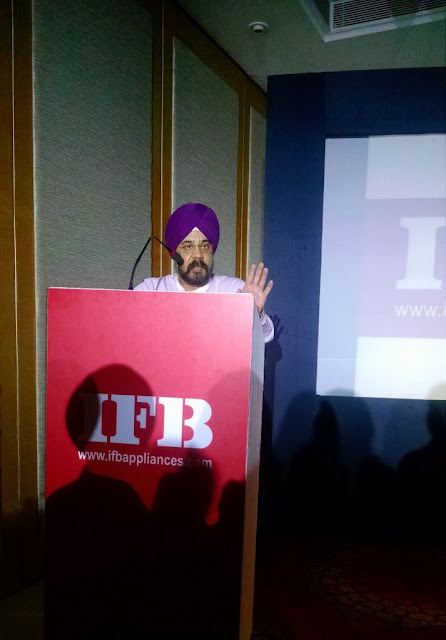 To conclude, I must say this soap is crafted with best of natural ingredients and is wonderfully nourishing for all skin types. Even if you are not fond of drinking buttermilk, put it to use externally and your skin will be grateful to you. Indians have a different attitude for their cooking and eating habits today. They want healthy food that is quick to cook and tastes great. 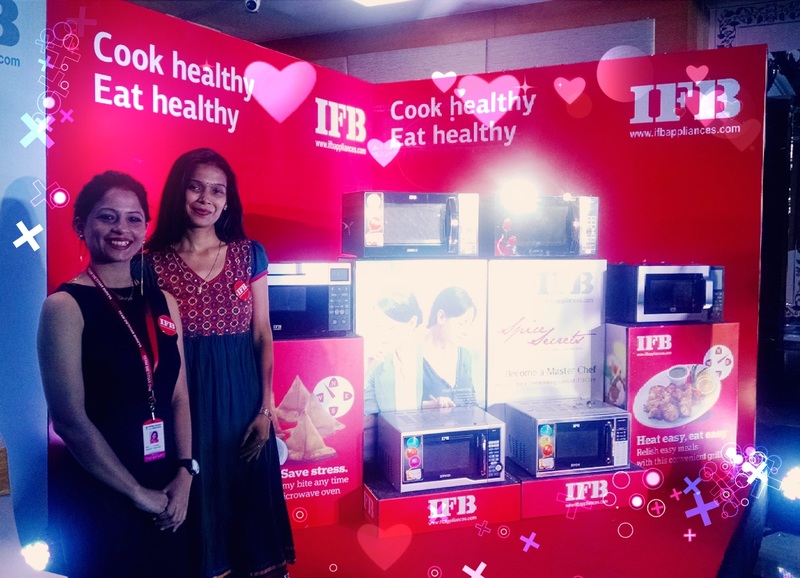 Keeping this viewpoint in consideration, IFB has designed the microwaves based on the concepts of Oil Free and Healthy Cooking. The IFB oil-free microwave range is packed with unique features for modern lifestyle and boasts of preparing oil-free food for the new generation that is very particular for calorie count. 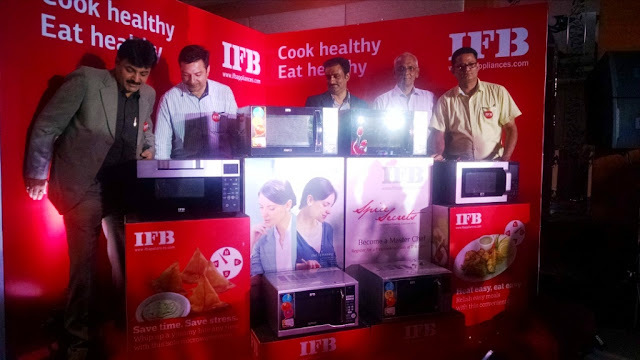 The most popular consumer durable brand announced this new range micowaves at Taj Hotel, Chandigarh on 24th August to cater the needs of health conscious customers. 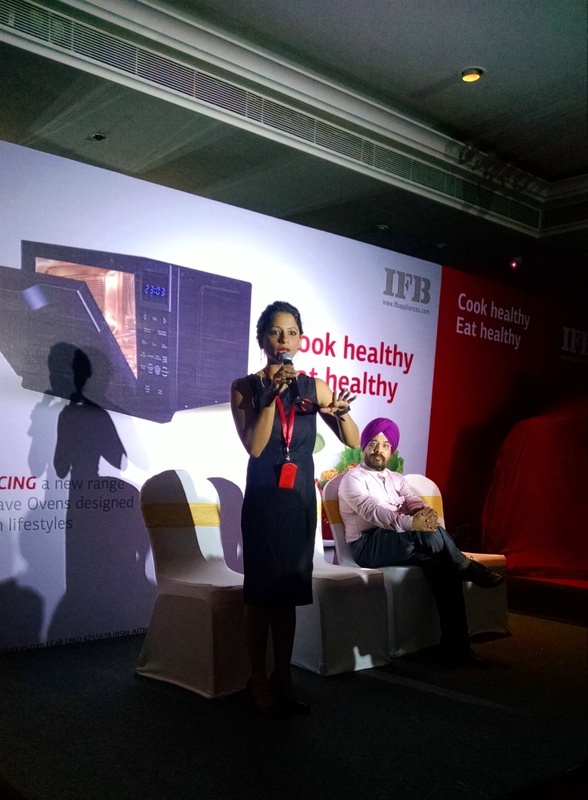 A live demonstration was given in presence of noted dietician Dr. Shreya while Dr. U.P Singh (Cardiologist) spoke about ill-effects of oily food and stressed upon healthy eating habits. A total of 6 models have been launched under this Cook Healthy range of microwaves that would have capacity between 20-30 ltrs. suited to the needs of every household. 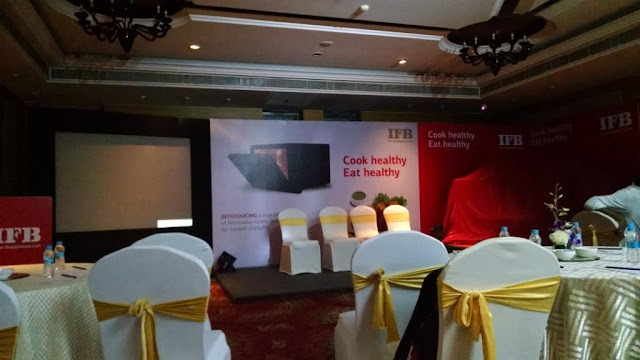 Addressing the media persons soon after the launch, the IFB team proudly announced that "packed with a host of innovative features and cooking functions like Heater Selector, Motorised Rotisserie, Turn Grill etc, the new IFB microwaves are perfect solution to those who want to cook healthy n hassle free." 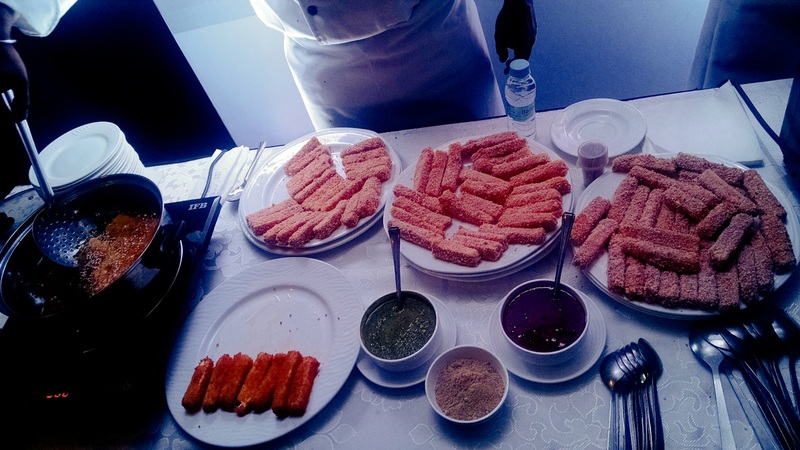 The hotel chefs prepared tasty snacks with and without oil at the venue itself and gave us a chance to express our opinion after tasting. There have been some requests from my readers to recommend any hair care product that works on hair fall and dandruff issue which is more common in people of all ages and all genders. 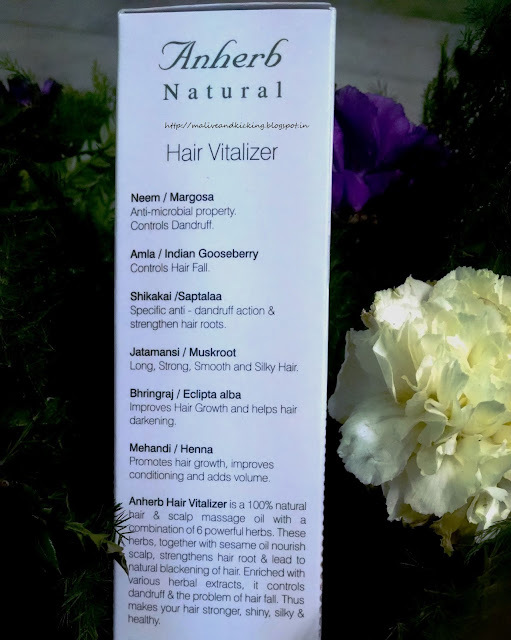 So today I'm reviewing a herbal hair vitalizer from Anherb Herbals that is designed for strengthening your hair with a unique blend of six herbs and provide hair & scalp nourishment to your dull n weak hair. 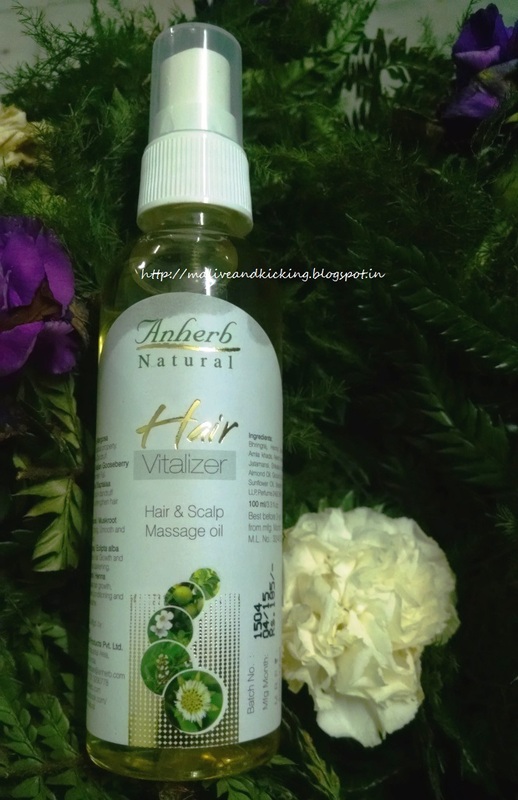 Anherb Hair Vitalizer is a 100% natural hair & scalp massage oil with a combination of 6 powerful herbs. These herbs, together with sesame oil nourish scalp, strengthens hair. 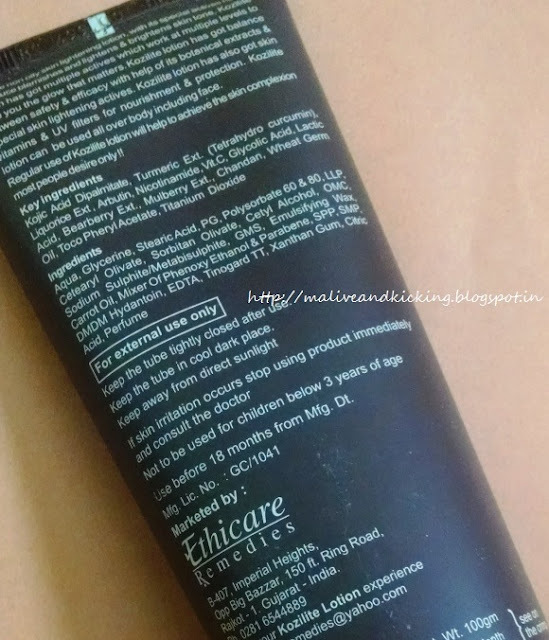 Enriched with various herbal extracts, it controls dandruff & the problem of hair fall. Thus makes your hair stronger, shiny, silky & healthy. Ingredients: Neem / Margosa: Anti-microbial property. Controls Dandruff. Amla / Indian Gooseberry: Control Hair Fall. Shikakai / Saptalaa: Specific anti - dandruff action strengthen hair roots. Jatamansi / Muskroot: Long, Strong, Smooth and Silky Hair. Bharingraj / Eclipta alba: Improves Hair Growth and helps hair darkening. Mehandi / Henna: Promotes hair growth, improves conditioning and adds volume. Apply it on the scalp, massage gently. Leave it for 1 -2 hours or for better results leave it overnight. Apply thrice a week. 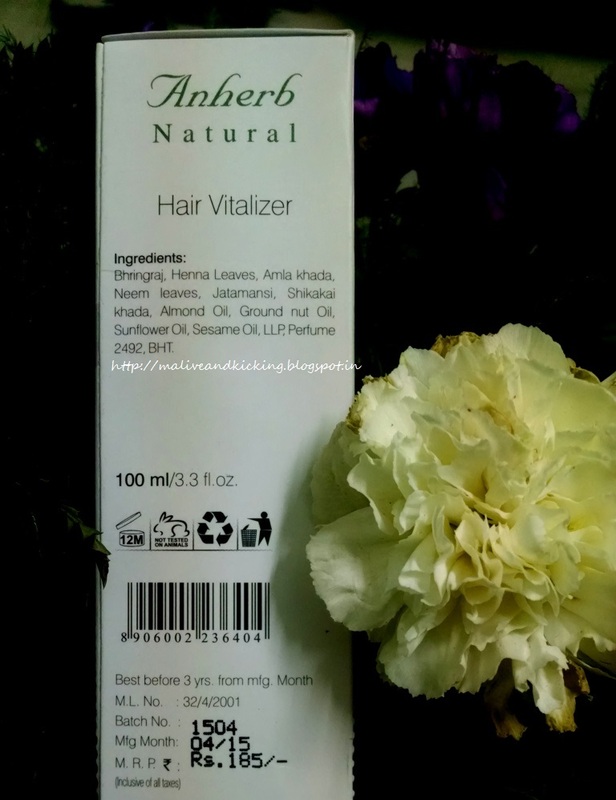 Anherb Hair Vitalizer is basically a hair and scalp massage serum. 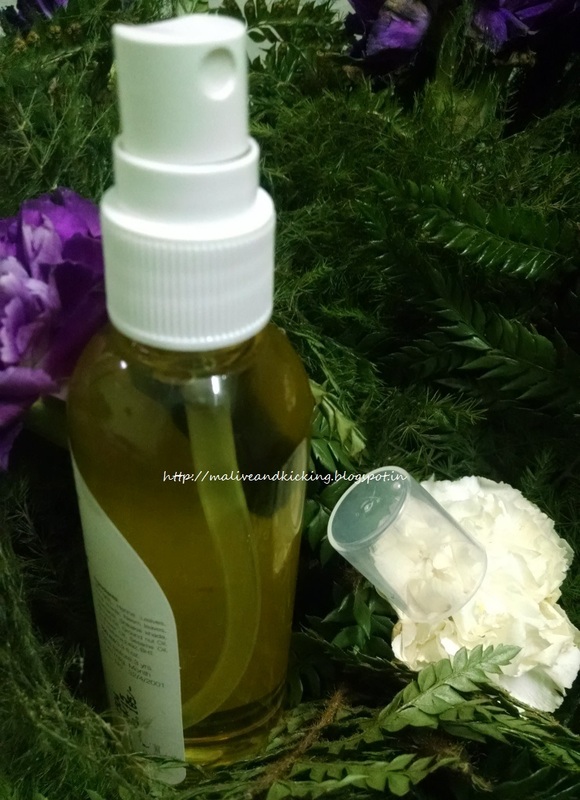 I specially picked this product because it is oil based and using it to massage my scalp would have given me twin benefit of routine head massage as well as extra nourishment of herbs infused in it. 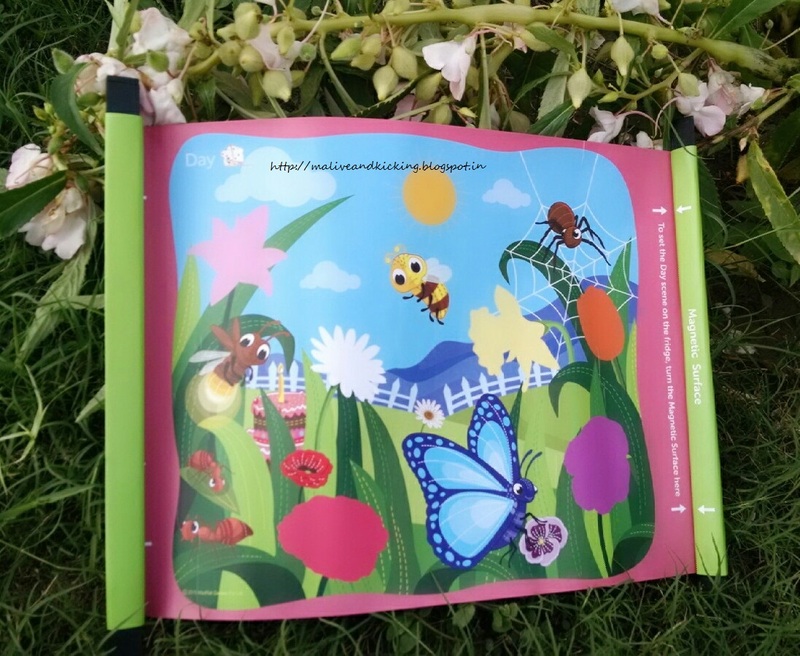 Beginning with its packaging, its a comfortable spray dispenser containing the product. You don't need to wrestle the packaging to ooze out the serum. The transparent dispenser lets you see the left over quantity any moment. The top cap on the spray head is a real good fit. 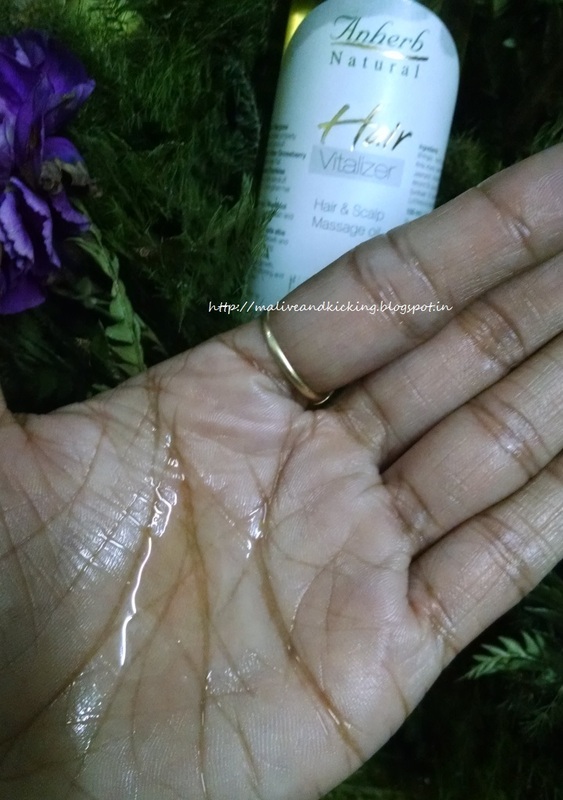 The vitalizer serum itself is a colorless liquid with slight golden shine to it. The herbs that have gone into its infusion effective work on any dreadful condition of your hair. I have been applying it for quite some time now. My frequency to use it is not fixed as such, but I try to massage my hair at least twice a week with this vitalizer. I divide my hair into sections, spray the vitalizer and leave it on my hair overnight after a gentle massage with my finger tips. I wash my hair next morning because I don't prefer stepping out in oily hair. The vitalizer has a rejuvenating herbal fragrance that relaxes my mind indeed. The beneficial mix of neem, amla, shikakai, mehandi, bringaraja n jatamansi prevents scalp infections, strengthens roots and controls dandruff. The rate of hair fall has gone down to some extent which had been really high due to monsoon season. So I would continue the usage of Anherb hair vitalizer for few months more to attain better results and stimulate growth of hair. Unique blend of powerful herbs. 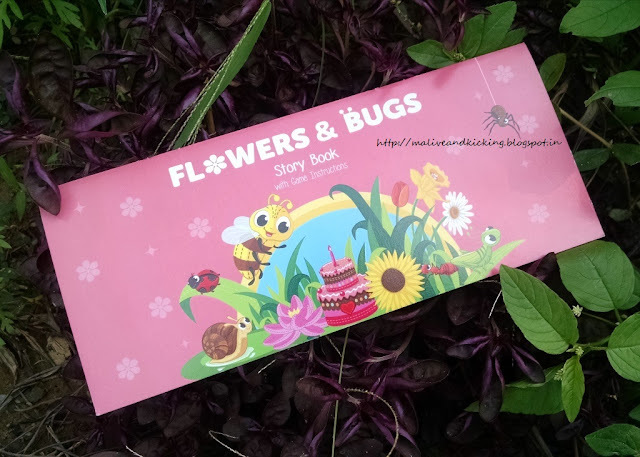 Smells herbal due to its ingredients. Makes hair more manageable post usage. Suitable to all hair type. Some may find the smell strong, but I liked it that way. Do leave your comments if you have tried this product or a similar one.. I am making you familiar with a skin lightening lotion today that is packed with rich botanical extracts that promises to give you even toned skin that you desire...The product is Kozilite Non-Oily Skin Lighteneing Lotion from a well known brand Ethicare Remedies. Kojic Acid, Turmeric extract, Liquorice extract, Arbutin, Nicotinamide, Vit. C, Glycolic Acid, Lactic Acid, Bearberry extract, Mulberry extract, Chandan, Wheat Germ Oil, Titanium oxide. Caution: Not to be used for kids under 3 yrs of age. The product comes in plastic tube of chocolaty brown color which seems very attractive to me. The tube is contained in a cardboard box following the same color theme. The tube and the outer pack have complete details of the product printed on both. 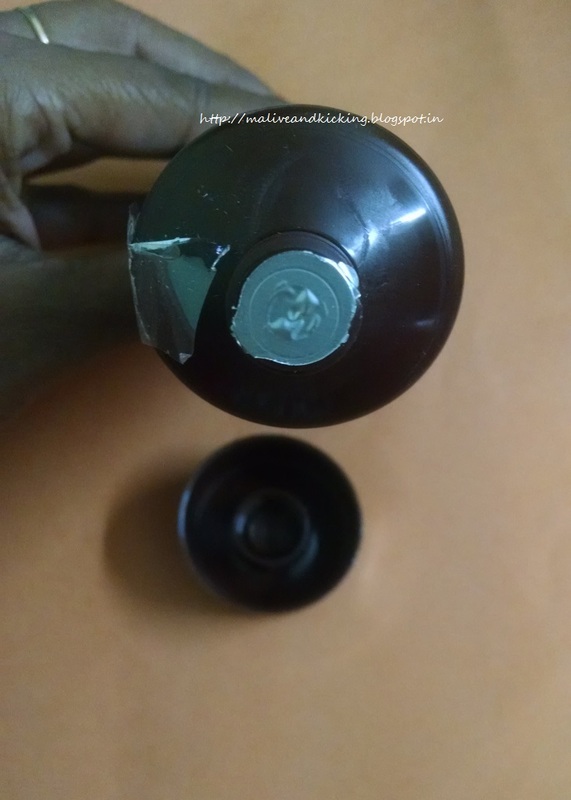 The screw cap as well as the tiny nozzle inside the pack is neatly sealed to avoid any spillage. 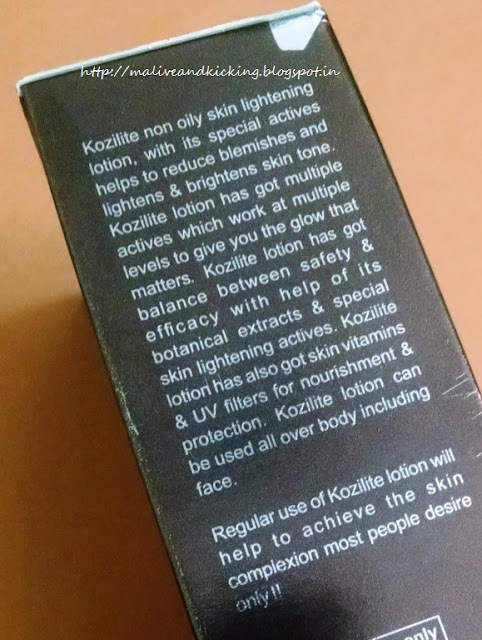 The Kozilite lotion is a pale yellow liquid. The consistency of the lotion is very thin. The tube packaging of the product has a tiny nozzle on its top which I expected would be ejecting little quantity on pressing the tube softly. 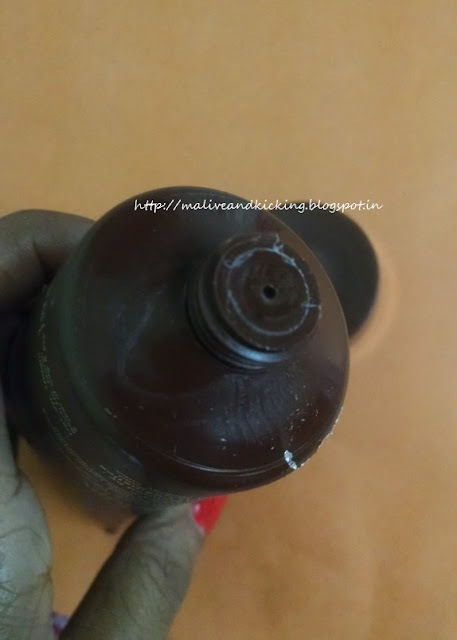 But due to the runny consistency, the lotion came out as soon as I turned it upside down after opening the cap. 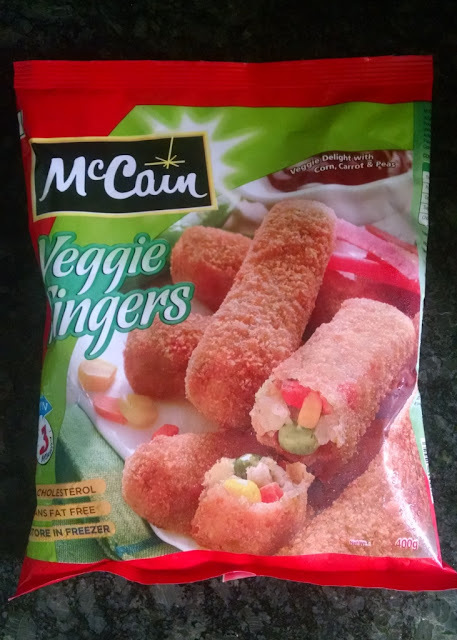 This is something I didn't like about the product. 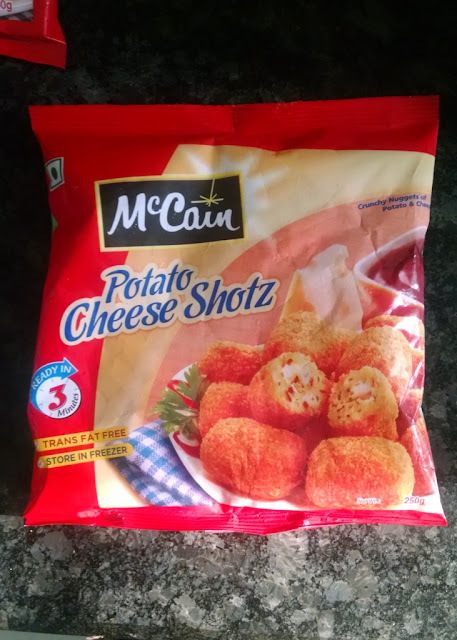 Because there are chances of wastage if extra quantity comes out than required. The lotion has a mixed perfume that I couldn't related to one single ingredient, but is somewhat closer to mild smell of Chandan. The fragrance stays for not much longer, but you may still feel it if sniffed your skin intentionally to check. 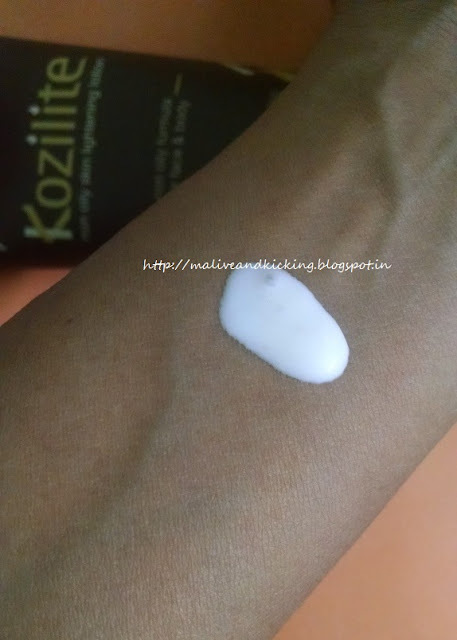 The lotion is lightweight with non greasy feel and easily gets absorbed through the skin. It leaves no shiny, oily, whitish layer behind post usage, which I liked a lot. Packed with moisturizing oils and vitamin C, the effectiveness of the product can be swear by. 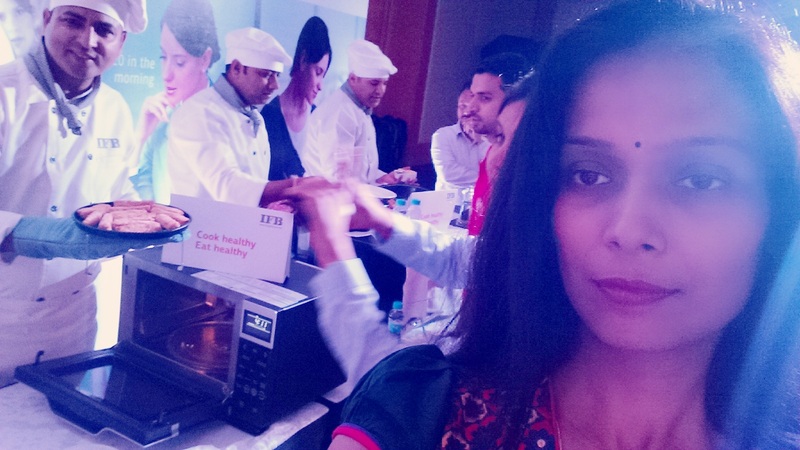 It is one product that can be used on face and entire body. It can be used at any time of the day, but I feel its best to give yourself a light massage after bath or shower with this lotion until thoroughly absorbed into skin. The skin remains hydrated for quite long after its application. In my opinion, it would help out the dry skin beauties to great extent. 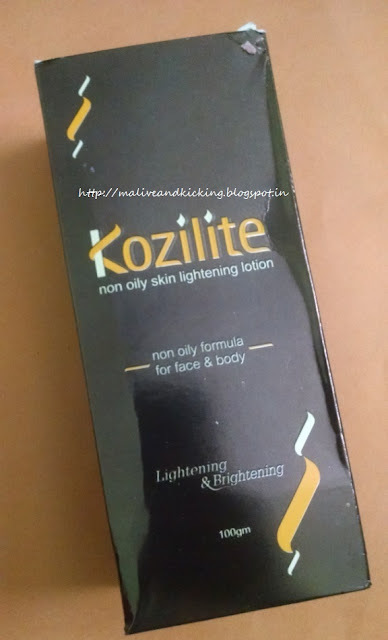 Though its not too oily to be avoided by normal and oily skin types. 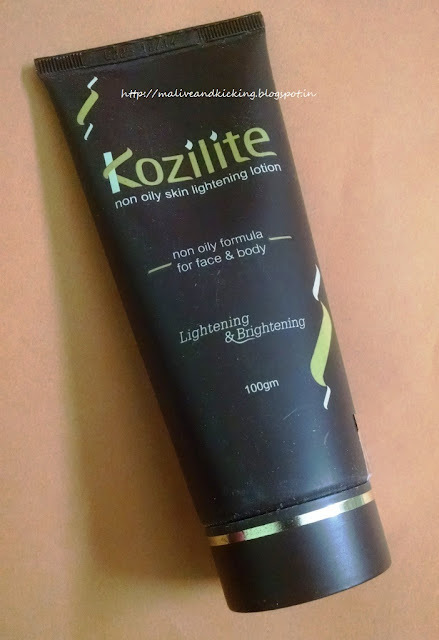 Continued use of Kozilite helps lighten skin pigmentation and improve overall skin texture for fairer, and even skin tone. 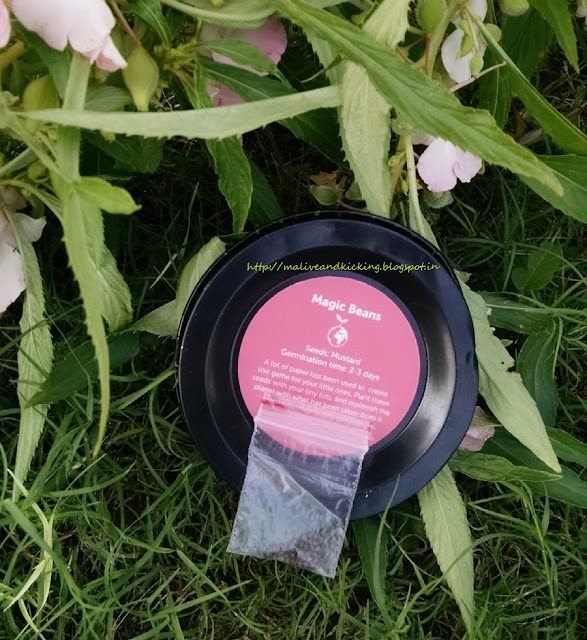 I won't claim that it may transform your appearance magically, but I totally trust the botanical ingredients like bearberry extract which is a natural skin brightener and mulberry extract that may even cure your dark spots. The effects of chandan and turmeric are known to the world and they have been infused in the product to achieve the result. My final verdict is in favour of the product, provided the lotion had been a bit more concentrated for my liking. I find anything in heart shape so cute and adorable, be it a piece of jewelry, print on an outfit, a candy or even a soap bar ;) How exciting it is to imagine yourself holding a beautiful bathing bar with little hearts imprinted on it. This is something I felt when I received a lovely handmade soap from a natural skin care brand Sheer Care. 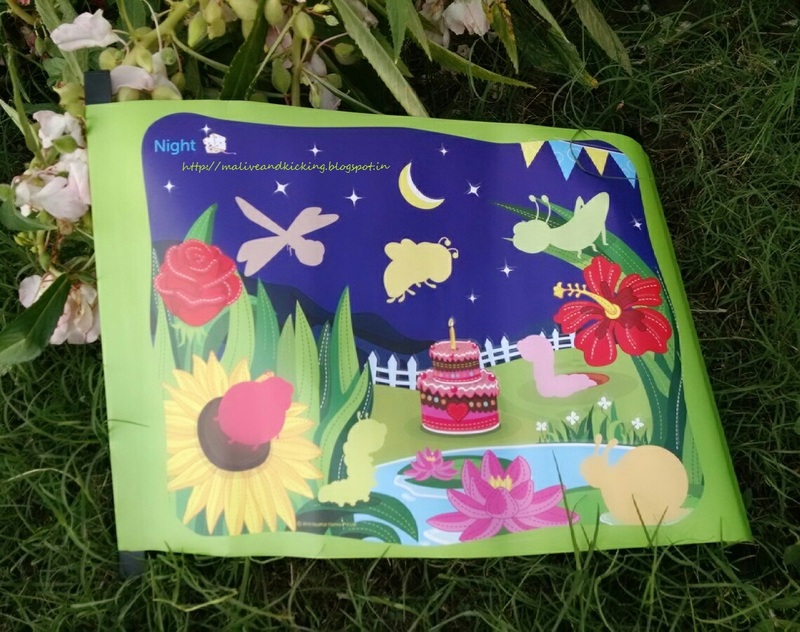 We prepare our products without using any 'harmful chemical'. 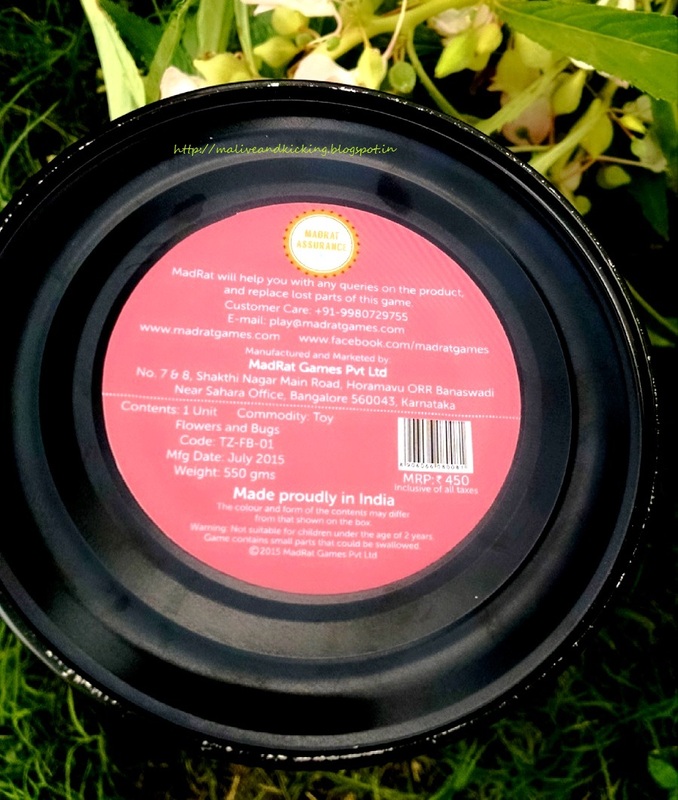 We use natural colorants, skin safe fragrances, essential oils, pure carrier oils, clays, herbs, fruits, flowers etc in correct proportion to formulate our products to provide you a safe and healthy daily care, and a toxin-free routine. We do not buy readymade bases of skincare products, add on something, and claim 'handmade'. We prepare each product from scratch, in small batches, so that we use least amount of natural preservatives to reach you safely and remains intact till consumption, ensuring highest quality product for you. 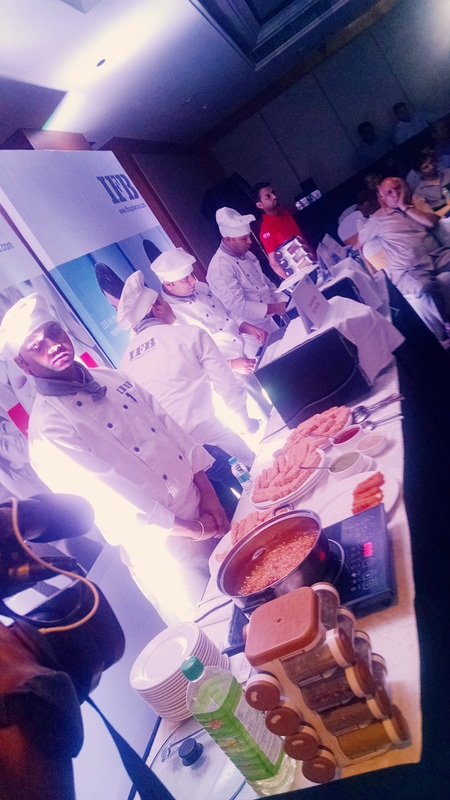 We prepare these products at home, as well as cut ,wrap and label at home. You may not find the packaging very attractive like other sellers, but we assure you of a genuine quality product for the price you pay! 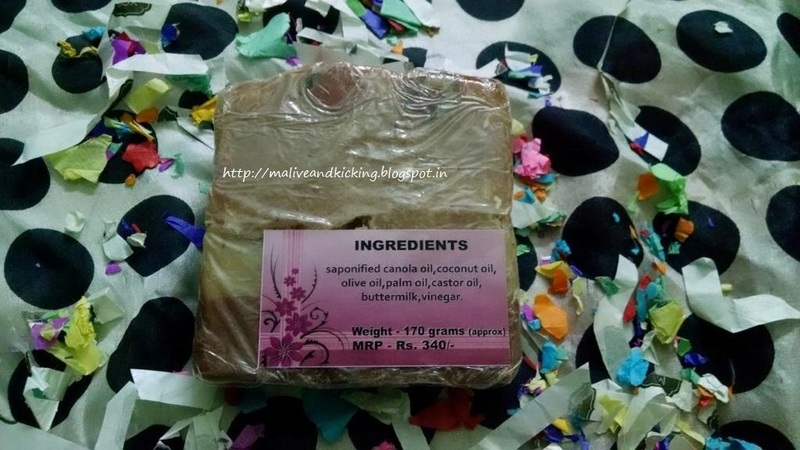 These little hearts on soap and mild fragrance,with the goodness of nourishing oils like olive,rice bran,sunflower,etc is a perfect sweet gift for anyone on any occasion. Castor oil, coconut oil, olive oil, palm oil, rice bran oil, sunflower oil, beeswax, water, red clay, pink clay, activated carbon. 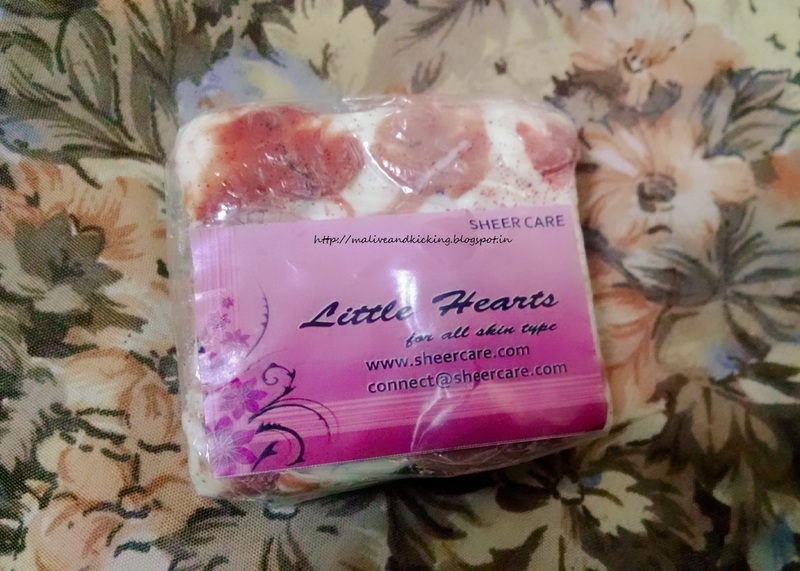 Little Hearts soap comes wrapped in a cling sheet. There are labels on either sides of packaging stating the soap name and its detailed ingredients with price etc. The soap bar is designed with cute little hearts embossed with so much of delicacy. The tricolor soap bar in the first appearance reminds you of a tasty sandwich ;) Why?? because the soap bar is a triple layered soap with offwhite base, green center and the top layer with heart designed on it. The Little Hearts soap is a clay based soap with a generous mix of multiple essential oils. The soap has no artificial fragrance, but a natural smell of a combination of its ingredients. It didn't feel that floral feminine one, but truly an invigorating aroma. Also the smell doesn't lasts as soon as you rinse the skin up. The clay is believed to absorb oil from skin surface without excessively drying it. The pink clay gently draws out the impurities from skin and soften the skin. 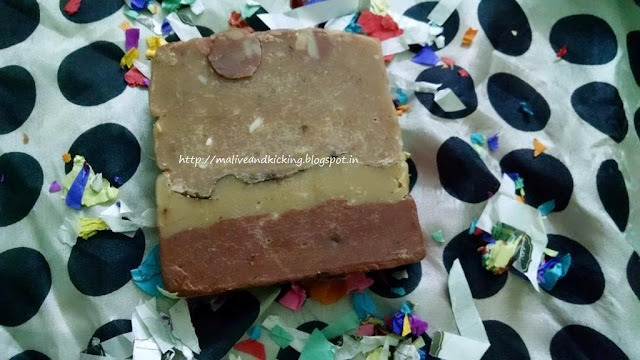 This soap is especially suited to my dry skin type but also works well as a face and body soap for most skin types. 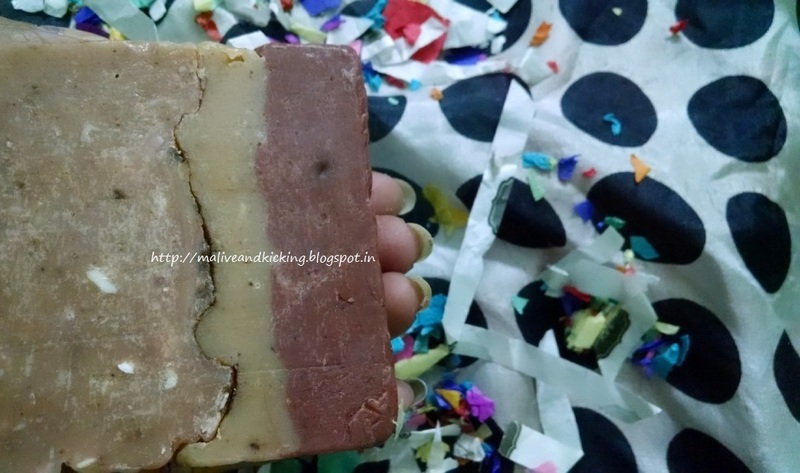 Its silky lathers doesn't feel extremely soapy on skin that required lot of rubbing to rinse it out. Just few splashes of water with soft touch to your skin in enough to cleanse the skin. The rich blend of oils with red clay genuinely kept my skin exfoliated and even worked on lightening tanned areas of my neck. So I am expecting a better skin toned after some more days of using this soap. Most amazingly, unlike most facewashes/facial soap require me to apply moisturizer/lotion post shower, I dont use any after using this soap and still my skin feels happy and purified. 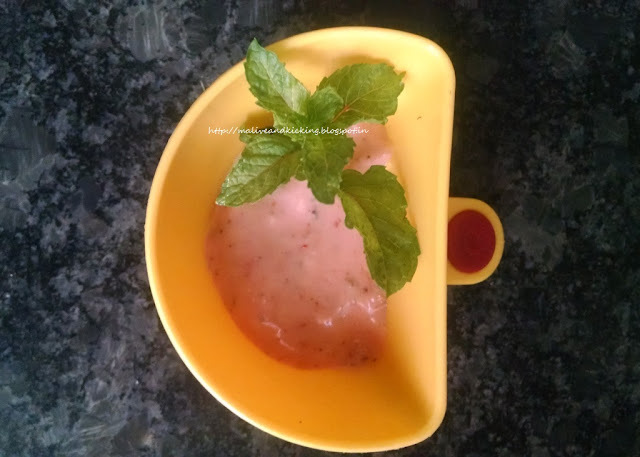 Uses clays as natural detoxifiers. I wish if the packaging could be improved a bit to keep the soap in a cardboard box to avoid disfiguring such pretty soaps made with loads of effort. Being a busy working mom, I am always looking for ways to keep my toddler occupied with something creative when I am at home after work. There are basic household chores to be performed while I want to attend to my baby's needs & observe his cute activities too. Usually when I'm working in kitchen, a constant thought keeps running in my mind what he is up to as soon as I turn my sight away from him. 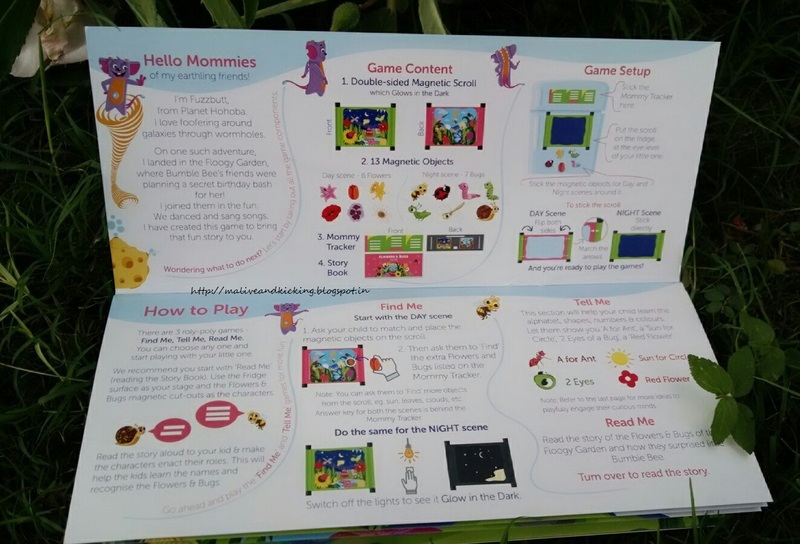 I am sure every toddler needs closer supervision of his mom/dad all the time...However, realizing this dire need of parents to keep their toddlers engaged, Madrat Games has recently launched an interesting game Todzzle for children aged 2-4 years. 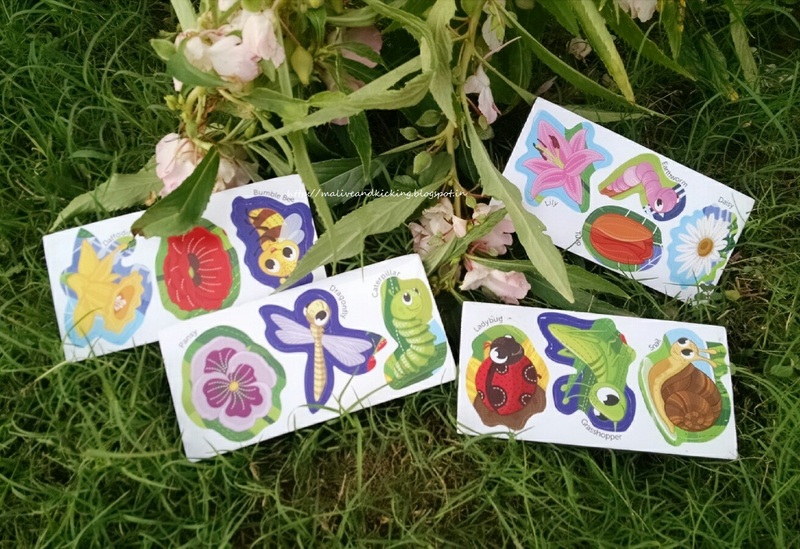 Toddlers are a curious lot, wanting to learn new things. This is the age at which they learn their first words. 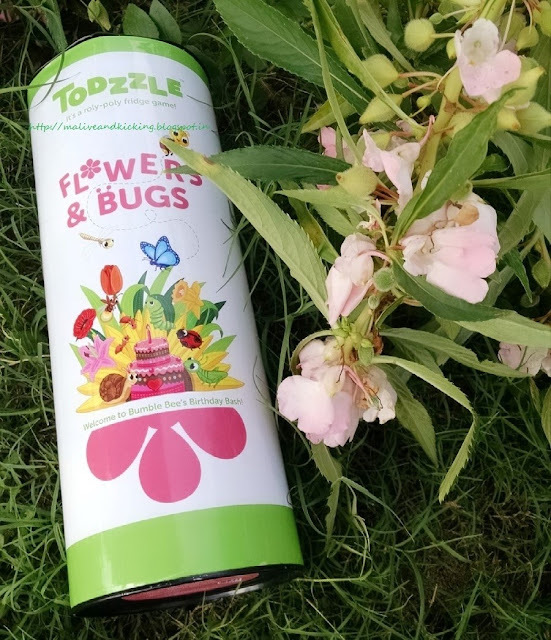 Todzzle provides an exciting platform for kids to learn these words and make correlations between various things around them. 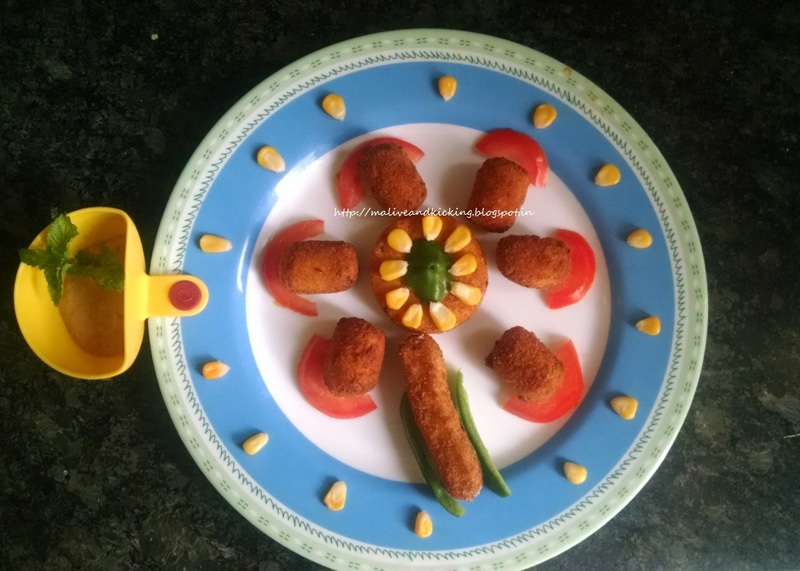 each of which sound equally favourite exciting and attractive for kids. I received the Flowers & Bugs themed puzzle for my junior which comes in a colorful cylindrical packaging. What does the Todzzle contain? How do we play with Todzzle? The game is designed to help mother and child bond over play when mommy is busy with cooking or any other household. 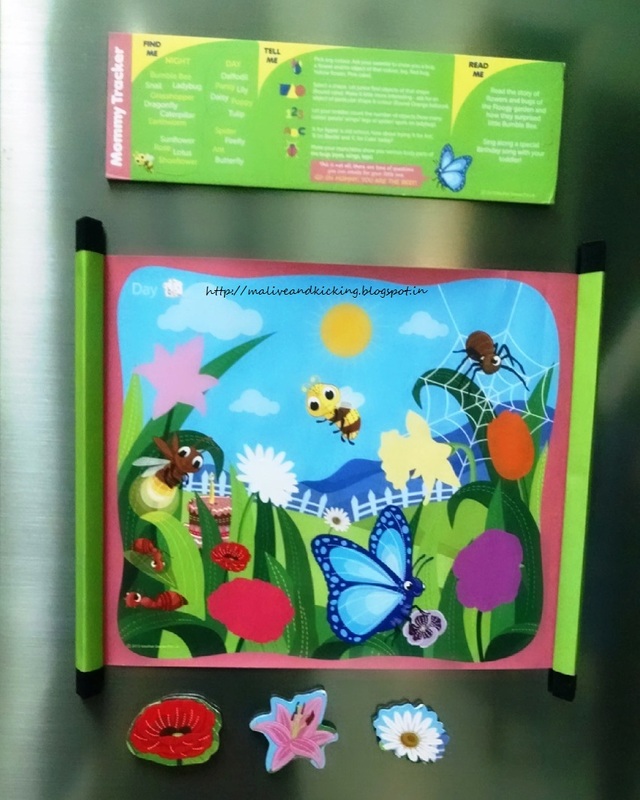 I put the colorful magnetic scroll on the fridge using magnetic surfaces on both sides at a convenient height where it is easily accessible to my little boy and then he tries to match and fix the magnetic objects where their shapes are drawn. Introducing the game to my little one included myself reading out a story to him from "Read Me" story book while sticking the scroll on the fridge and asking my boy to help the magnetic characters enact their roles by placing them on the mat. At the same time, I ask him to find extra objects not covered in the story, but seen on the puzzle using "Find Me" section. 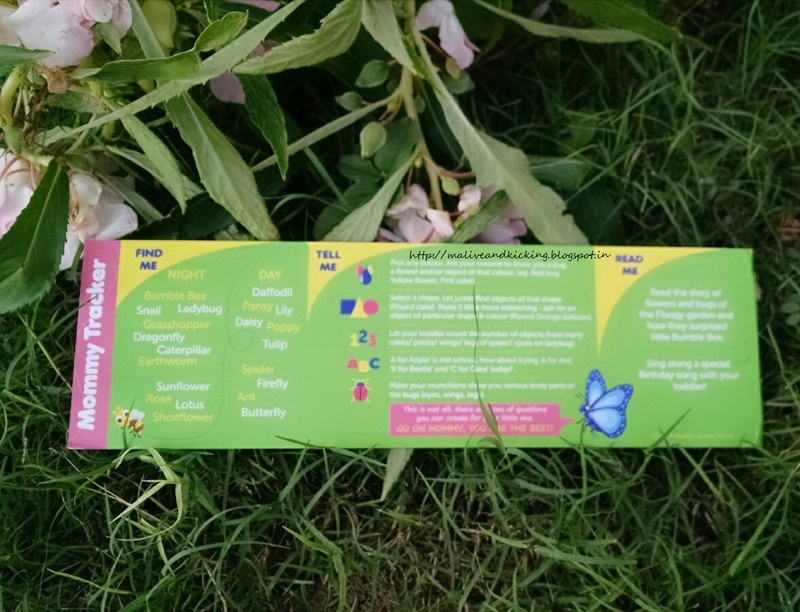 Now the unique 'mommy tracker' is an assessment of child's understanding. I use "Tell Me" section to ask easy-peasy questions from my child on topics such as colour, shape, size, number, alphabets, body parts etc. Playing this knowledgeable game with my boy not only makes him happy, but gives him a sense of pride when he answers my question correctly ;) Only after a few days play, the intelligent boy has started devising smarter questions to ask me. I feel overjoyed that the game is NOT meant for killing time like making toddlers sit in front of television, but is giving him right kind of exposure to his small world around. 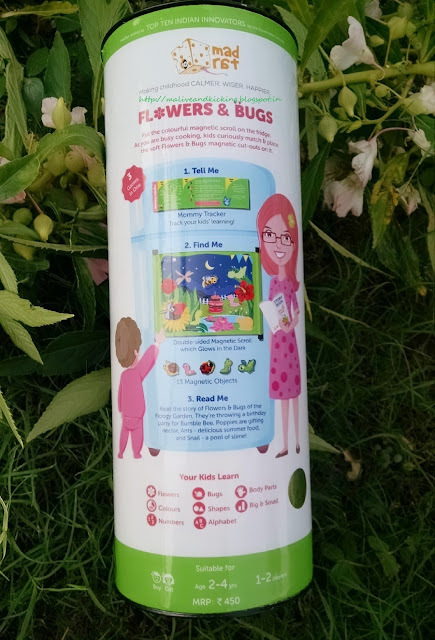 Most importantly, even letting my child play independently with todzzle helps me handle my primary concern to fix an eye on him at all times. I am planning to extend the game by trying it different ways like playing it as Color Matching game, Shape Sorter game, See n Draw game etc. Now, if you are curious of how much does this game cost? 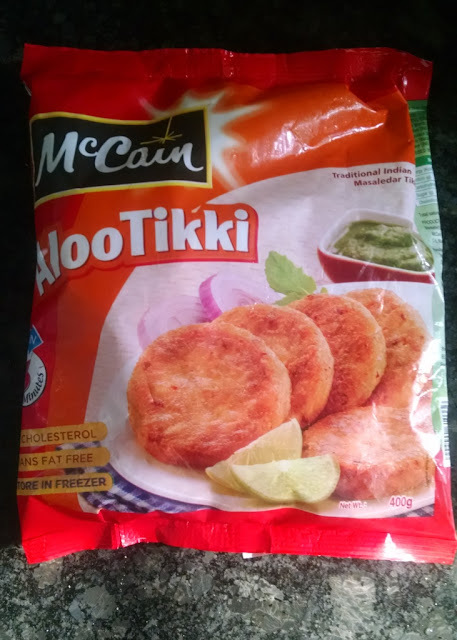 It has been priced really economical at INR 450. As of now, this game is in its pre-launch stage and is not available for purchase. But the Todzzle will be available on Flipkart and Amazon very soon. 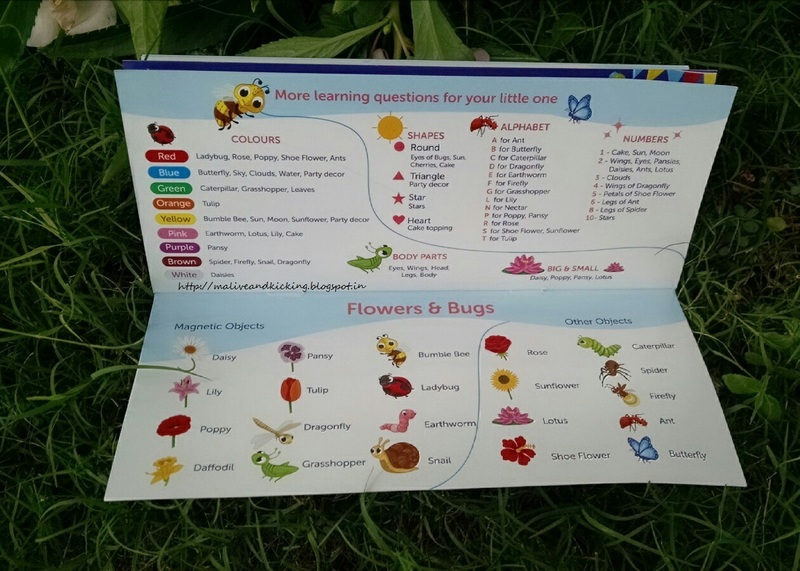 Todzzle is an informative playmate for a young learner. 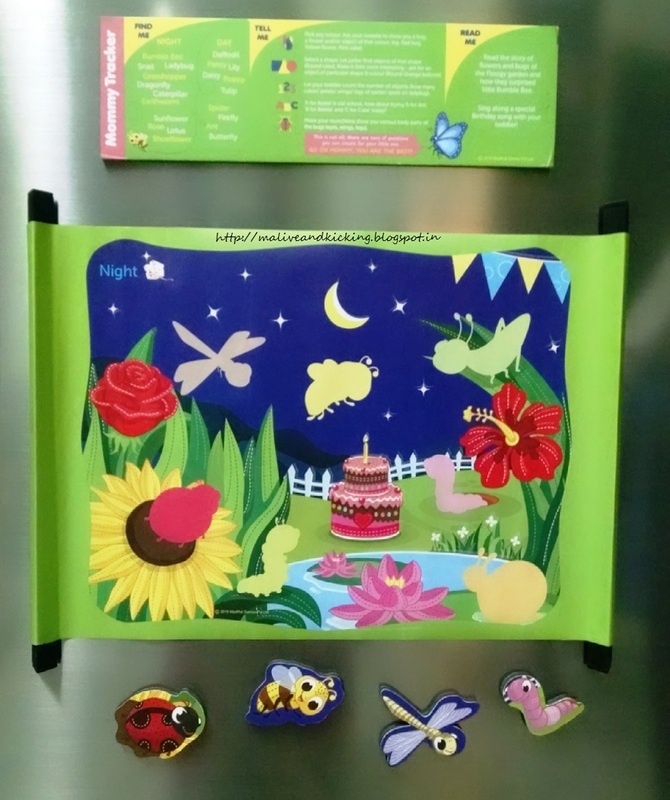 It makes an ideal age-appropriate game for children whose mommies want to give a calmer, happier and wiser childhood to them.